Today's teens love time in front of the computer...what better medium to have them hear the Word of God. 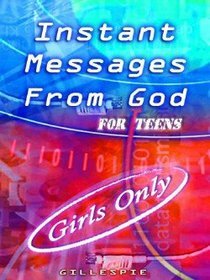 Relevant, straightforward, and deeply spiritual, Instant Messages from God -- for GIRLS Only! deals with a full-range of teen issues - peer pressure, temptation, self-image, destructive behavior, dating, parents, the future, building a meaningful relationship with God - and all in a style that youth understand and relate to, yet, still presenting God's Word clearly and powerfully. - Publisher This engaging new series touches on a full-range of teen issues--peer pressure, temptation, self-image, destructive behavior, dating, parents, the future, building a meaningful relationship with God, and so much more. About "Text Messages From God (Girls Only)"
This engaging new series touches on a full-range of teen issues--peer pressure, temptation, self-image, destructive behavior, dating, parents, the future, building a meaningful relationship with God, and so much more.